Allen's Hummingbird: Breeds along the coast from southern Oregon to southern California. Resident in southern California; winters in Mexico. Preferred habitats include coastal chaparral, brushlands, and edges of redwood forests. The Allen's Hummingbird status has changed relatively little over the past few years. 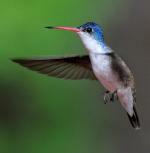 This species of bird is native to the United States and Mexico but it has also been found in Canada as well. Currently, there are more than half a million individual birds in its native range. Although this species of bird was rated as Lower Risk in 1988, currently the Allen's Hummingbird population is not believed to be in danger of significant decline and is rated as Least Concern. The change from Lower Risk to Least Concern occurred in 2004. 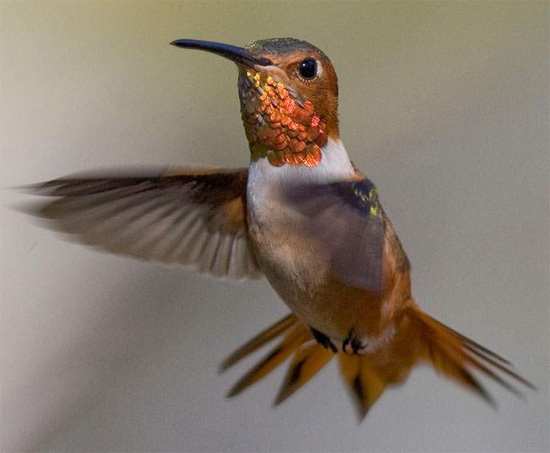 The courtship flight of the male Allen's Hummingbird is a back and forth arc of about 25 feet, similar to the motion of a swinging pendulum, followed by a high-speed dive from about 100 feet. They are aggressive in defending nesting territory from other hummers, and have been known to attack and rout birds several times larger than themselves. A group of hummingbirds has many collective nouns, including a “bouquet", "glittering", "hover", "shimmer", and "tune” of hummingbirds.